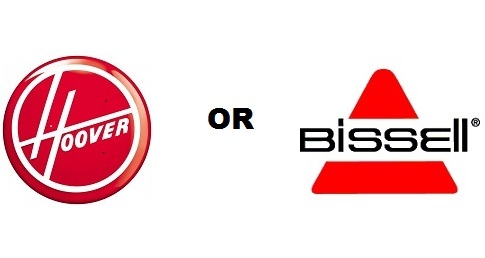 Hoover vs Bissell, which brand produces better carpet cleaning machines? This discussion is most relevant for the category of regular upright cleaners. Bissell carpet cleaning machines dominate in the professional and portable carpet cleaning machines categories. (See Types Of Carpet Cleaning Machines) For the most popular category of home carpet cleaning machines, regular upright home machines, Bissell and Hoover are head to head in competition. This post is dedicated to discussing the pros and cons of each brand’s upright home carpet cleaners. Both brands look good, and there are tons of positive reviews for their most popular models of upright carpet cleaners. Many shoppers wrestle with the choice of which brand to choose, so here is a comparison of their pros and cons. Hoover and Bissell full-powered upright carpet cleaners are equally effective in cleaning power. The pros and cons of each brand’s machines balance out to deliver on par results for users. Many users observe that their Hoover machines have better suction power. This allows for more dirt and dirty water to be suctioned into the machine from the carpet. 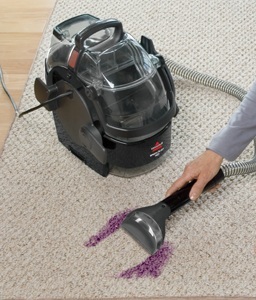 Better suction power also means that the carpet tends to dry faster. Bissell’s carpet cleaners incorporate either a hot water heater feature or their patented Heatwave technology. This allows water to stay warm longer. In turn, the warmer water provides an extra boost in cleaning effectiveness. Both Hoover and Bissell upright carpet cleaners have top-of-the-line brush systems. Hoover incorporates a SpinScrub system of counter-rotating brushes that give carpet threads a thorough cleaning. Bissell’s DirtLifter brushes are proven in scrubbing stains and agitating dirt particles off carpet threads. Both companies also offer a wide array of detergent formulas that will optimize the cleaning power of their machines. Each new carpet machine from either manufacturer typically comes packaged with a trial size bottle of their respectively branded formula. On the balance, customers are equally satisfied with the cleaning results from both brands. Users with experience using both brands’ machines are split in how they rate them in cleaning performance. Some prefer Hoover’s results, while others prefer Bissell’s. There is no clear winner here. Both machines are able to provide very high quality cleaning results in the end. Compare Hoover and Bissell machine models using our Carpet Cleaner Comparison Chart. Bissell’s consumer grade regular home carpet cleaners tend to have a lower motor amperage compared to Hoover cleaners. Hoover designs their machines to work with 10 to 12 amperes of motor power. 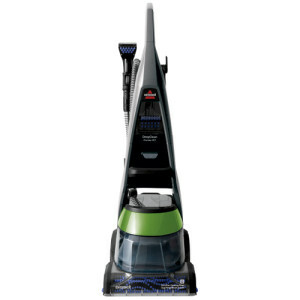 Typical Bissell consumer grade upright cleaners have 6 amps of power. Only select models with built-in heaters like the Bissell ProHeat 2X 1383 operates on 12 amp motors. Otherwise, Bissell’s regular cleaners for home use are usually 7 amps or lower in power. For example, the very popular Hoover Power Scrub Deluxe has 10 amps of power, compared to the Bissell DeepClean Premier Pet Carpet Cleaner 17N4 with 6.2 amps of power or the Bissell ProHeat 2X Revolution with 6.8 amps of power. This could be why the suction on Bissell machines has been observed to be a little weak by some users. Bissell’s “bladder” water tank system. The inner bladder is being filled with clean water. 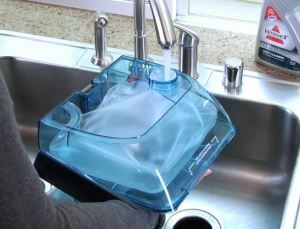 Most of Bissell’s regular upright machines use a single tank “bladder” system for clean and dirty water. Clean water is filled into a “bladder” pouch within the water tank and used to clean the carpets. When dirty water is suctioned back into the tank, it fills up the tank. A waterproof diaphragm membrane separates the clean water from the dirty water. With Hoover’s system, there are separate water tanks. Each system have their pros and cons. Bissell’s single tank system allows users to handle only one tank when changing out water. With a dual tank system, the user need to carry two tanks to the faucet/bathroom – one to empty, one to fill. However, most users do not find this a big problem. In comparison, a single “bladder” tank has its quirks: some users do not like the task of fitting the two-part single tank in place each time they refill. Many users choose Hoover partly because they want the ease of a two-tank system. The tanks are clearly separated. One can throw out the dirty water tank without touching the clean water tank. This clear separation can come in handy when a lot of dirt (eg. pet hair or mess) is suctioned in and the dirty tank gets filled quickly. A number of users find the Bissell’s bladder system of clearing out of dirty water awkward, especially when there is still clean water and detergent mix in the internal bladder tank that could be used. More about this factor is discussed in this detailed comparison. Even Bissell’s professional grade model uses a two-tank system. In 2015, Bissell introduced the Bissell ProHeat 2X Revolution (1548, 1548T, 1551). This is the first regular Bissell full-powered upright cleaner we know of that comes with a dual water tank system. In 2015, Bissell introduced the Bissell ProHeat 2X Revolution (1548, 1548T, 1551). This is the first regular Bissell full-powered upright cleaner we know of that comes with a dual water tank system. In terms of how long the machines last, both brands machines perform almost equally well. The majority of users are able to get multiple years of usage out of these machines, but there is a minority percentage of failures that occur within the first year. Based on anecdotal feedback and reviews from users, we estimate it to be around a 5% ballpark failure rate across both Hoover and Bissell upright machines, in the first year of use. Problems that surface include leaking tanks, loss of suction, brushes that stop rotating and broken parts. On their internet reviews, some users mentioned having their Hoover and Bissell’s work for 7 years and longer to their great satisfaction, and there are others who faced problems in their machines in the first year. There is an element of luck here. It is widely known that consumer-grade upright home carpet cleaners are not as well-made as the professional quality ones. Users seeking a trouble-free carpet cleaner machine experience are best served by professional/commercial grade units. The obvious drawback is that it will cost an extra $250 upfront, and depending on your objectives, it may or may not be worth the money. 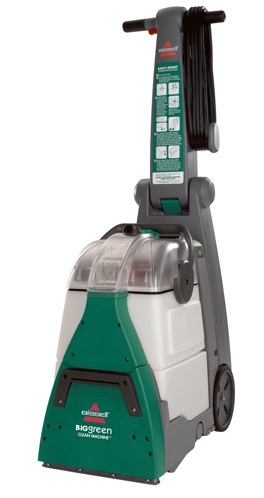 Compared to Hoover’s regular upright carpet cleaners, Bissell’s models tend to be bulkier and heavier in their build. Bissell’s machine designs are getting slimmer with their newer models, but on average they still tend to be bulkier if you compare then side-by-side with Hoover’s models. As an example, the very popular recent Hoover upright cleaner, Hoover Power Path Deluxe FH50951 weighs just over 18 pounds and has dimensions Height 43 1/4 x Width 11 1/2 x Depth 17 1/4 inches. Bissell’s similar grade model, the Bissell ProHeat Essential 8852 weighs 24 pounds and has dimensions Height 43.0 x Width 11.0 x Depth 20.0 inches. To be sure, Hoover does produce some heavier models like the Hoover MaxExtract 77 or Hoover MaxExtract Dual V, but those tend to be higher end ones with more features; such as incorporating a wider cleaning path. Bissell may be moving towards lighter and more compact designs. In 2015, Bissell introduced the Bissell ProHeat 2X Revolution 1548, a full-powered upright consumer-grade model that weighed under 18 lbs. If you prefer a smaller unit, check out our Portable Carpet Cleaning Machines section. These are very popular small sized units for cleaning spots and stains instead of room-sized areas. All carpet cleaner machines from both manufacturers have what it takes to clean pet stains well, with or without the “pet” label. It’s not just the machine’s hardware itself – the type of cleaning formulas used will make a difference. Both brands offer specialized pet stains treatment and detergent formulas. Some machines are sold under pet and non-pet labeled titles. The only difference between the two could be in what they come packaged with. For example, one comes with a sample bottle of pet stains cleaning detergent and the other comes with a regular strength carpet cleaning solution. Pet owners may find that Bissell offer more choices in terms of “Pet Carpet Cleaner” models. Hoover carpet cleaning machines are often not labeled as pet stains cleaning models. However, Hoover’s carpet cleaners are meant to be used by pet owners, even if the “pet” label is not there. A tremendous number of carpet cleaner purchasers for either brands are pet owners. 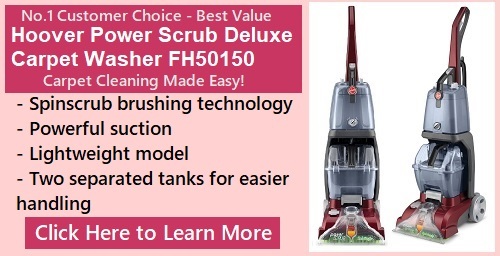 In 2017, Hoover introduced an enhanced version of its best-selling Hoover Power Scrub Deluxe, and named it the “Power Scrub Elite Pet Carpet Cleaner FH50251.” The new model comes with a few additional features like a quick cleaning mode, antimicrobial spin brushes, larger tank size (1.25 gallons) and slightly wider cleaning path. 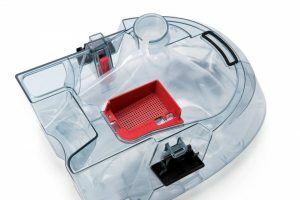 One hardware feature that Bissell’s top pet carpet cleaning models have over their non-pet models, and over Hoover’s machines, is their Pet Hair Basket feature. This allows pet hair to be collected and dumped more easily. Users are supposed to vacuum their carpets to remove pet hair before using the cleaner. Still, a lot of times, even with vacuuming, pet hair still gets lodged in the carpet threads. The Pet Hair Basket feature potentially makes the removal of pet hair easier to deal with. In practice, this has not proven to be a killer feature. Users do not appear overly impressed with this, and some say that pet hair often do not travel that far to the tank and caught by the collector. More information on the topic of pet carpet cleaners is covered in our Ultimate Pet Carpet Cleaner Machines Guide. For years, the standard has been 1 gallon sized tanks for regular home-use carpet cleaners from both Bissell and Hoover. Since 2013, Bissell has introduced newer home carpet cleaning machines that feature larger sized 1.25 gallon water tanks. Hoover has followed suit on that, introducing the Hoover Power Scrub Elite Pet Carpet Cleaner FH50251 in 2017 with a 1.25 gallon sized tank. 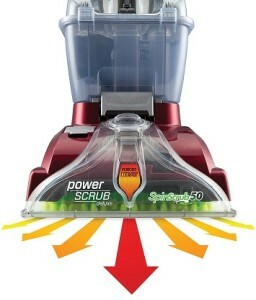 This Power Scrub Elite FH50251 machine is an enhanced version of the best-selling Hoover Power Scrub Deluxe FH50150. Some users welcome these new larger sized tanks, as it means less trips back and forth to the sink to change out the water. Others just like the gallon size tanks, as it means a more compact design. Bissell still offers numerous models with 1 gallon tanks, such as the Bissell Essential Proheat 8852. Traditionally, Hoover cleaners feature 1 gallon-sized tanks. Hoover has a couple of larger-sized models with 1.14-gallon sized tanks, such as the Max Extract 60 and Max Extract 77. Both Bissell and Hoover offer high quality home carpet cleaning machines. They each present pros and cons. If you don’t have a preference for specific features, a Hoover machine may just make more sense. Hoover regular upright carpet cleaning machines are typically priced lower for the same cleaning performance. 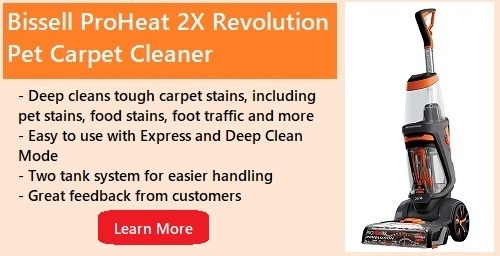 See Carpet Cleaning Machines Reviews for a list of top upright carpet cleaners, and links to reviews of other carpet cleaners. I have had both brands of machines,Hoover machines most of them have a separate clean water and soap compartment in same tank,so if you only need to rinse carpets then you do not have to waste any soap ,it can stay in the tank.Most of the Bissle machines still use a tank that you must mix soap and water together,so if you rinse after and still have soap in tank you must empty it out and wash it out to get rid of all soap left behind. I am not sure which type of brushes work better,seem to do same job. The are both really great brands that certainly have pros and cons. Great overall unbiased review that I are definitely tough to find on the web. I received my Hoover Power Scrub with extra wide cleaning path with credit card points at least 26 years ago and it still cleans carpets perfectly! It has been lent to multiple people over this time period, so it’s been USED! The only thing that has failed over these multiple years of usage is the plastic lip that touches the floor (it has been bumped into base boards, etc. over the years of usage) You know plastic gets brittle over time. Two pieces of plastic have cracked and broken off on each end BUT it STILL suctions like a champ and works like a charm. I will purchase a Hoover carpet cleaner again when and if mine craters! Wow, sounds like you have gotten an awesome cleaner machine! The Hoover Power Scrub was introduced only in the last few years, so it must have been another model that you have gotten. Nevertheless, your story is uplifting. It’s funny the last two carpet cleansers I have had have purchased are Bissel and they both had separate tanks for the dirty and clean water. Neither of them had a bladder pouch. I have always bought the small, inexpensive kind. I have a small apartment with maybe 500 square feet of carpet. One lasted six years and this last one lasted seven years. I have dogs. They track in stuff so I clean my carpet once a month. My ex has had expensive Hoovers that have lasted three or four years with lots of problems. Excellent article. Very helpful and informative. You have helped me make a decision. Thank you. Thank you for that unbiased appraisal of both manufactures. I found this review very helpful. I really appreciated the fact that you treated both companies with respect and just stated the facts about them both. You have made it very easy for me to now make my choice. Great job done here on this review. I appreciate you very much.